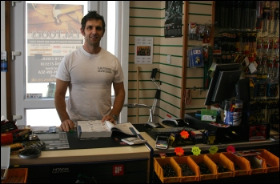 The owners of IM Tools in Burnham-on-Sea have made the decision to shut up shop for good this September after five years of trading. IM Tools in Burnham is set to close despite business “going well” according to owner Ian Everett-Giles. The shop will be selling off all its remaining stock – from suppliers including Stanley, Makita and Hitachi among others – in the run up to its final closure. The news comes less than three years following the closure of Burnham-on-Sea DIY independent Salways, which had traded in the town for more than 100 years.